Many old houses, libraries, and modern buildings feature recesses, alcoves, bay windows, and nooks. A well-planned bay window will greatly enhance the architectural effect of a home. Window seats in bay windows in the living or bedroom can serve as a relaxing retreat for reading. A child’s bedroom with a bay window becomes a special hideaway. A bay window in the kitchen can serve as an alcove for the dining table and chairs providing not only ambiance but extra floor space. Great window seats, which at times fill bay windows, can be covered with cushions of every size. 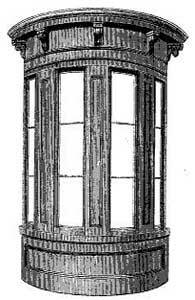 A bay window is a window projecting from the wall of a building so as to form a recess or bay within and, properly speaking, rising from the ground or basement, with straight sides only; but the term is also ordinarily applied to such projecting windows with curved sides, properly called bow windows, and also to projecting windows supported from the building, above the ground, properly called oriel windows. The bay window is a window peculiar to late Gothic and Renaissance architecture, so called because it forms a bay or projecting space outwards from a room. The external walls of bay windows are, for the most part, either rectangular or polygonal, the semi-circular form, from which the term “bow” was probably derived. Bay windows generally reach to the floor, and are frequently supplied with a seat, which is called the “bay stall.” There are many very beautiful examples of bay windows in the college halls of Oxford and Cambridge. 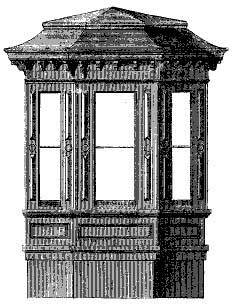 When used in upper stories, such windows are supported on corbels, or large projecting mouldings. Bay windows naturally lend themselves to decorative treatment. With the addition of masonry or brickwork they often assume a massive and bold appearance. When constructed of wood the framework is surmounted usually by a wooden cornice, and the wooden roof is covered with lead, slates or tiles. 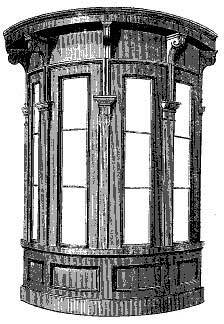 The window frames may be arranged as fixed lights, sash and frame, or casements. The most usual arrangement is to have the lower lights fixed, and the upper ones as sashes hinged to open for ventilating purposes. Bay windows should be used judiciously. They may be effective in the design, or they may greatly mar it, according to the skill of the designer. The interior aspect of bay windows is by no means the only consideration, for by reason of their shape and projection they become chief features in the exterior design. Whether one wishes it or not, bay windows always attract attention. For that reason they must be carefully proportioned and attractively detailed. In many houses otherwise well designed, the effect has been spoiled by injudicious use of bay windows, situated, perhaps, where they are useful, but with an appearance detracting from the general effect. 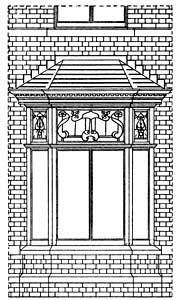 Treated with understanding, bay windows can be made to help out greatly in the design. Some bay windows are built without having a foundation from the ground, the whole being projected from the wall of the building. 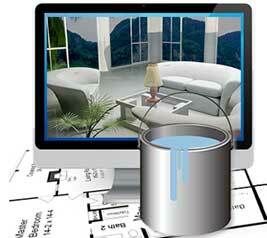 The covering of bay windows depends altogether upon the design of the house. The roof treatment of the bay windows not only adds to their apparent height but also gives to them a charming quaintness and originality. The roofs of bay windows are typically covered with the same material as the roof of the main building. A bay window is one that projects beyond the face of the wall. The side lights may be either splayed or at right angles to the front. The window openings may be formed by having stone or brick mullions or piers at the angles, against which the window frames are fixed, or the wooden framework of the window may be complete in itself. When the latter is the case, it is usual to have stone or brick work to the sill level.